Cretan Thyme Honey by Saviolakis Family was added to your shopping cart. Highest quality Thyme Cretan Honey by Saviolakis Family. Collected from the White Mountains at an altitude of 1,500 m.
Highest quality Cretan Thyme Honey by Saviolakis Family, collected from the White Mountains at an altitude of 1,500 m. It's a region with natural beauty, pure and virgin, with rare endemic species of plants and animals protected by Greek and European legislation. The area is protected by NATURA and the National Park of Samaria. Greek Thyme honey is unique thanks to its aroma and taste, its high nutritional value, its stimulant and antiseptic properties, its preventative effect against cardiovascular disorders and its beneficial role against diseases of the urinary and digestive system. 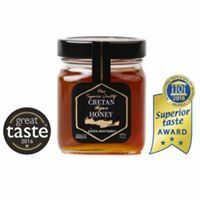 International Awards: Cretan Honey was awarded three gold stars from the International Taste and Quality Institute (iTQi) in 2016 and one gold star from Great Taste Awards.